Tendrils of Vitaceae species are formed oppositely to leaves. Several hypotheses have been proposed （reviewed in Shah and Dave 1970). One hypothesis is that a tendril is a main shoot tip and a main shoot in appearance is an lateral shoot formed at a leaf axil. Other hypotheses include a hypothesis that a shoot is monopodial and a tendril is axillary formed and fused with a stem until the opposite position of an upper leaf. However, Cytohistological studies showed that a tendril primordium is formed after the initiation of its opposite leaf, during which a shoot meristem of a main stem is maintained （Millington 1966; Tucker and Hoefert 1968; Sah 1960). This indicates that a main shoot is monopodial and tendrils are lateral organs. A reason why such lateral organs are formed at the opposite positions to leaves is still unknown. Tendrils sometimes accompany a shoot (see a right bottom picture) but it is unknown when the new shoot meristem is initiated. Millington, W.F. 1966. The tendril of Parthenocissus insert: Determination and dvelopment. Amer. J. Bot. 53: 74-81. Sah, J.J. 1960. Morphohistogenic studies in Vitaceae. I. Origin and development of the axillary buds in Cayratia carnosa Gagnep. Phytomorphology 10: 157-174. Shah, J.J. and Dave, Y.S.（1970) Morpho-histogenetic studies on Tendrils of Vitaceae. Amer. J. Bot. 57: 363-373. Tucker, S.C. and Hoefert, L.L. 1968. 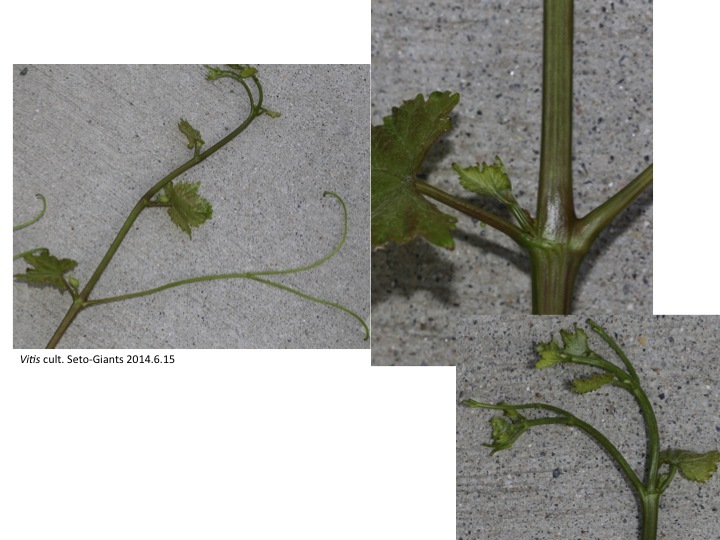 Ontogeny of the tendril in Vitis viniferra. Amer. J. Bot. 55: 1110-196.